We handle your application so that you access your rebates and start saving quickly! Lowers Your Monthly Energy Bill! With Lennox, bring quality and affordability into your home. We remove your old unit, clean your utility room and install the new piece professionally and safely. 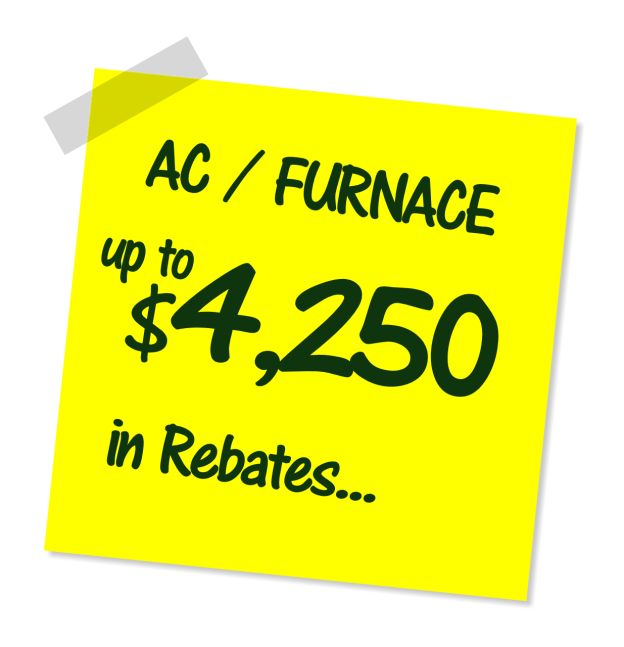 Save Up To $4,250 in Rebates! Why a High-Efficiency Furnace is the BEST Investment Decision! A high-efficiency natural-gas furnace makes all the difference. It offers you ideal heating comfort meanwhile using significantly less energy than any other heating method including electricity, oil or wood heating. Gas furnaces heat the entire home quickly while circulating filtered air within the home. Newer ENERGY STAR® furnaces that are available have an AFUE (annual fuel utilization efficiency) of 95% or higher. The AFUE number represents how efficiently the furnace converts fuel to energy. Gas furnaces have an input rating that is expressed in BTU per hour. This is how the size of the unit is expressed. Common sizes are 40 000,45 000, 60 000, 70 000, 80 000, 90 000, 100 000, 110 000 and 120 000 BTU/hr. It is extremely important that your unit is the correct size for your home. A furnace that is not the right size for your home it can cost you in several ways. The comfort level of your home will be affected if your system is sized incorrectly. If it is too small, it will not be able to reach the temperature desired in your household. Your house will not warm up on the coldest nights of the year. If the system is too large, the unit will not run long enough to balance heat and add humidity in the air. You may also experience hot and cool spots throughout your home. Larger systems generally have a higher price tag so you may be spending extra money on a larger unit with an excess heating/cooling capacity that you will never use. Having an over-sized unit will cost you more to operate because of system efficiency meaning that the system will frequently be turning on and off. The efficiency rating SEER (Seasonal Energy Efficiency Rating) is given for a unit at design conditions and steady-state operation. Say Goodbye to Money-Guzzling Units! What is the Ideal Furnace Size for Your Home? Beware! When purchasing a new furnace, bigger doesn’t necessarily mean better, and smaller won’t always be cheaper.